There are 18 reviews so far. To add a review of your own for this item, visit the voting page. 1: The personalities of the characters have been captured beautifully...when the Doctor is being sarcastic towards Roses mum you can imagine him being this way (not hard if you've been following the series). 2: The plot is actually good! It is taking the most awful elements of the human character (greed & innocence) and exploiting it in this storyline. Who would have thought a computer game would be so addictive? Raising questions the media has asked a thousand times already. 3: The new books design is fantastic....much more worthy of that place on the bookshelf! The characterisations are very authentic and the story has some great plot twists. It's weird and surreal with villains who are comic at best, but holds together pretty well. The scene in which the Doctor agonises over altering Rose is unmissable. The new 9th Doctor books were realy good, I could'nt put them down. Love the hard back style. Winner Takes All is a winner! When I first read Winner Takes All I was taken back by the likeness of the page to screen in the format, the chracters and the settings. The first few chapters felt warm and friendly, with a visit to Jackie's and Mickey's the story is a nice little adventure and has its laugh out loud moments; the description of the Quevvils and the Doctor's usual humour resembling Russell T Davies superb scripts. Yet Jaqueline Rayner's writing is 'fantastic' and has its own character to it, she writes for the Ninth Doctor, Rose, Mickey and Jackie so well, you can almost see the Doctor's ever familar grin on the pages! The story of the new FREE video game 'Death to the Mandetoans' (can't spell, sorry! )is gripping and as mystery unfolds it becomes more and more gripping, furthermore despite reviews of a quick ending i think that it is satisfying and pleases to what it has been. As a 15 year old teenager aka life long fan i feel that Winner Takes All isn't to childish as some fans feared of the Ninth Doctor books and instead it is book for everyone including the fans, enjoy. Oh and by the way, when's Death to the Madateons out? Whilst this is a well written and enjoyable novel, its plot is lifted from The Last Starfighter and given a slight twist. The Last Starfighter was far from a great movie, but it did have an interesting idea for a plot - aliens who need someone to fight their wars for them put a video game in earth arcades and wait to find a player who can be their hero. Jacqueline Rayner has simply stolen this idea for her book. Sure it's a bit more complex, but essentially this is The Last Starfighter with the Doctor and Rose. And even if you think that Last Starfighter didn't engage some of the issues about the morality of killing things as a game, you'd be better looking at Terry Pratchett's Only You Can Save Mankind than here. Rayner's aliens are porcupines - a rather thinly veiled reference to Sonic the Hedgehog of video game fame (which she spells out later anyway). Rose's old school bully is cliched and the ending is a simple and lazy recapitulation of the end of World War Three on television. Original this book is not! All this is a shame since there is some great characterisation here - particularly the Doctor and Rose's relationship. And some of the ideas about how the game is played are good, leading to a genuinely funny sequence of the Doctor speaking to Mickey using Rose as a sort of ventrilloquist's dummy. But more of this is needed to redeem this novel. Finally got around to reading the second of the new Doctor books and all I have to say is that it was OK. The book seemed to drag in some parts and the ending just sort of happened, nothing too exciting in the resolution to the problem. I do have to say that the new books do capture the chemistry of the Doctor and Rose from the screen that brings some redemption to the weak story line. ...what were they again? One of the better books. but THE CAT isn't in it! My summary kind off says it all. I had no intention of reading this book, I wanted to read them in order and I don't have The Clockwise Man yet. But I was hooked after the first ten pages. 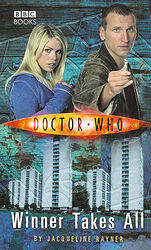 Rayner did the main charecters very well and I could belive that it was the 9th Doctor and Rose. I loved the interaction between Mikey and the Doctor. I was thinking as i read this book that it would have worked well on TV, but for some reason i couln't see it working as an audio adventure. The only critersisum i had was what Simon said about The last Starfighter Fighter, I was reading bits of it and thinking I've seen this in a movie (couldn't think of what one till i read Simons review). But didnt pick up on the Sonic the Hedgehog thing. The only other thing i wasn't convinced on was the aleins, I actualy found them anoying, i mean come on!! giant porcupines against giant praying mantices (if she had just had human vers human i think i would have given this book 10/10). lastely the books look good. I like Hardback books (probable why i picked it up), and these books look very nice on my book shelf. I look forward to haveing a shelf full of them. You don't even have to think hard to see how obviously a plot rip this is from Last Starfighter. I guess she thought we all forgot about that movie. This book is as unoriginal and as uninteresting as they come. ripped plot, laughable aliens and a local bully whose played out as a major villain. Give me a break. This book is Coronation Street at its worst. Sorry jaquline Rayner because I've now read ur other dr who books and they r rerall good but this is just weak. I like the idea of a dangerous comptour game and the idea of the hedgehog aliens. This was the first dr who book i ever read and i had it on holidays. i had plenty of time to read it by the pool but frankly, i'd rather have a nap and only manages to read 2 chapters in the whole two-week holiday. When i got home and started to read it more and as it progessed it did get better but your'e lucky it didn't put me off the other books. but it didn't, so it can't have been that bad. i loved the humour in it and the Tyler family. All in all, good effort but still weak. i loved this book . it was great . READ IT. One of my favourites out of the Doctor Who books (I have 26!) it goes from talking hedgehogs to video games. I have read this book so many times it is falling apart at the spine and I'm still not fed up of it. A brilliant read! Standard work of Jacqueline Rayner: Barely better than Fanfiction, if that. Smack dab in the middle of the mediocre, shallow characters and pre-schooler's kind of grasp regarding such things as motive, emotion and deception. I don't know why it is that when other authors can write a book that appeals to ages 10 - 35 that Jacqueline can't stretch it from more than ages 8 - 13. The plot is terribly unoriginal, so unoriginal that it's even been reused again in the Sarah Jane Adventures childrens spin-off - except better. The aliens were one dimensional, the technology strange and unsuitable, crappy badies, crappier non-baddies, haphazard and with a transparently obvious ending. Probably my least favourite so far... and considering I've read all but 7 out of 36 that's saying something. Really, really enjoyed this romp. Good story, tightly told with no filler. The writer gets the TARDIS crew (and Micky) spot on. Highly recommend.